In the latest issue of Environmental Health Perspectives, science writer Wendee Holtcamp highlights the manifold differences between unreasoned denial of scientific evidence and legitimate, rational controversy and debate. Being able to distinguish between the two, she notes throughout her essay, is crucial if one is to engage with listeners and convey his or her message as compellingly, effectively, and purposefully as possible. The piece is loaded with timely and applicable advice from a variety of sources, including — to name a few — Dietram Scheufele, the John E. Ross chair in science communication at UW-Madison; Naomi Oreskes, a professor of history and science studies at UCSD; and Katherine Hayhoe, at atmospheric scientist at Texas Tech, a research university situated in socially-and-politically conservative West Texas. 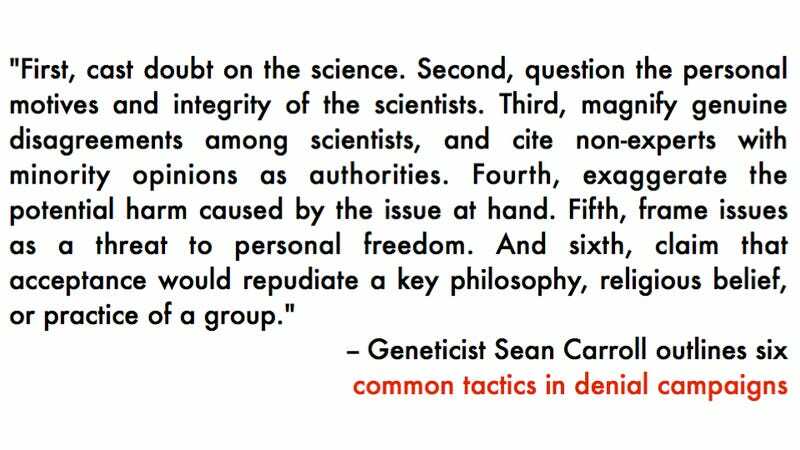 One of my favorite pieces of featured advice comes from geneticist Sean Carroll, in the form of his "general manual of denialism — six tactics used time and again in denial campaigns since at least the nineteenth century." It's a basic, albeit hugely helpful, guide to spotting denialism in your daily life, and a useful way to gauge the mindset of your audience when determining how best to approach your discussions surrounding science. Check out the rest of Holtcamp's piece over at Environmental Health Perspectives.